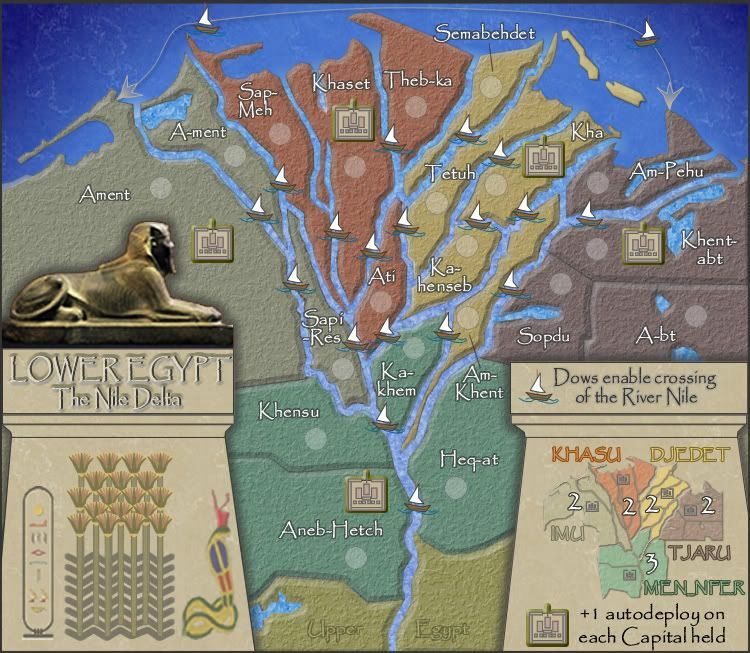 There have been several attempts in the past to get an Ancient Egypt map done without much success. I wanted to make a simple (is that a shock for cairnswk) map with a small number of terts due to the market forces at play in CC. This should be a good map for speed games. This could be the start of a quadtych! 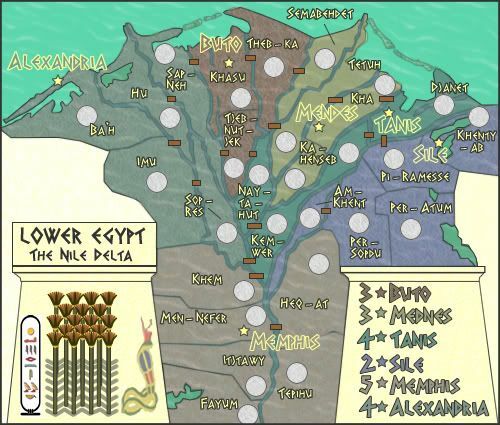 There are no particularly extraordinary features, except to say that the continents are named after egyptian capitals. 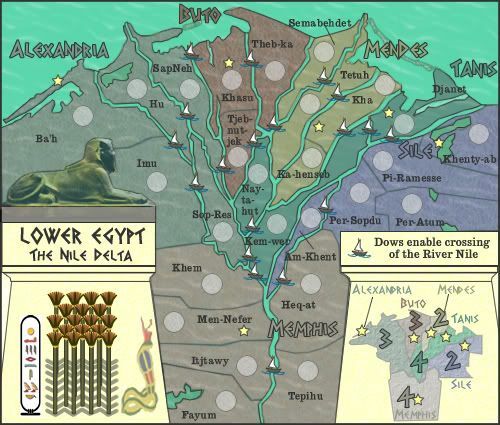 The cartouche on the left is the cartouche for the mapmaker, the symbol used is that of the lotus flower in the Nile, and the snake God of Lower Egypt Wadjet with the red crown of Lower Egypt the Deshret. Last edited by cairnswk on Sun Jun 08, 2008 9:08 pm, edited 47 times in total. very nice. I love the use of the delta. That really makes the map for me. I'm sure you'll fix this as you go on but a few of the labels and circles could be placed better. Sometimes they're too close together or too close to a river . I'm guessing you'll put your sig in the blank space above the title? That blank space is too much at the moment. I'm sure you'd fill it but I'll mention it anyway. The colours are a bit close to each other since they're muted. This makes differentiating them in the legend somewhat difficult. I think this map will be quite good! edbeard wrote: very nice. I love the use of the delta. That really makes the map for me. Thanks edbeard....yes the Delta makes for good simple geographic areas. As to the rest of your comments, thanks and noted, about 20 versions to come....Yes?! Watch for an update. Shock Horror, what's the CC world coming to? cairnswk is going to do a simple classic style map. 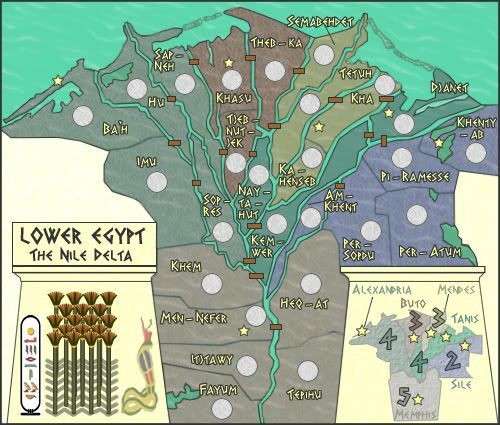 EGYPT LOWER - based on the Nile Delta - 24 terts approx. lol i read the title i was like WHAT?!? Yeahh!!! Cairns is making a simple map ! So Cairnswk is making a simple map, classic style, i would have thought that would have brought great rejoicing and lots of comments. for things wanted. Common people...surely this can't be that bad. well I didn't know there was an update, but the only difference I can see is that you have labeled each of the continents. honestly I don't like the way you've done it. I really like the colours you have and the dull look that they give. Maybe try doing a mini-map? Or just doing the text (for continent labels) in a different way. Or, perhaps blend them in somehow. If the rivers are borders, they need to be closer to the color of the sea. Currently they are a little hard to see. Lightening then up would make the bridges stand out more as well. edbeard wrote: well I didn't know there was an update, but the only difference I can see is that you have labeled each of the continents. edbeard...thanks for that...i amusing the minimap suggestion on the V2 update. WidowMakers wrote: If the rivers are borders, they need to be closer to the color of the sea. Currently they are a little hard to see. hi WM...will do next update. I love the way it looks. Maybe now i will understand one of your maps! Kaplowitz wrote: I love the way it looks. Maybe now i will understand one of your maps! ah...the simple style kaplowitz. good on you. Changes...mainly to the legend and the river itself as suggested above. Any more interest in this? I think its chief weakness right now is its plainness. There's not even a bonus for holding capitals of multiple regions. It's plain Risk with pastel colors. Perhaps spice it up with a few unique features? TaCktiX wrote: I think its chief weakness right now is its plainness. There's not even a bonus for holding capitals of multiple regions. It's plain Risk with pastel colors. Perhaps spice it up with a few unique features? Tacktix....thanks for that suggestion but there is going to be no other bonuses. This is going to be plain risk all the way. Another thing is the heavy amount of hyphens higher up the delta. It looks like you've got plenty of space to mess with, so de-hyphenate places that aren't normally hyphenate. The hyphenation makes it look more crowded than the map actually is. TaCktiX wrote: Another thing is the heavy amount of hyphens higher up the delta. It looks like you've got plenty of space to mess with, so de-hyphenate places that aren't normally hyphenate. The hyphenation makes it look more crowded than the map actually is. Thanks Tacktix...i found it was the Greek style lettering that was cluttering the map....most of the names that are hyphenated are so because that it their translation. So I'm afraid they had to stay. But the change of font might assist the appearance of some terts. I've also added dows as rivers crossings as these would have been used in ancient times. And of course the gilded Sphinx of Tutmose III brings some pleasure to the eye, but nothing over the top....i hope. Do you mean for the yellow continent to be separated from itself somewhat? What I mean is that Semabehdet isn't connected to any other Mednes territory. Memphis is WAY too high. 5 for two defending territories and only three territories can attack it? Seems like a +3 to me. Maybe I'm wrong, but I think the only difference between Buto and Tanis is that Tanis has one more continent that can attack it? It has the same number of defensive territories, the same number of territories overall, and the same number of territories that can attack it. I'm not sure if the +3 vs +4 difference makes sense here. Maybe someone else has a different opinion on that. :oops: Oops...blundered there, didn't I? Please refresh to see the changes in V3. I'd probably switch the bonus numbers for memphis and alexandria. But, I still think they're all +3 except for the right most continent. Not sure that can be changed too much (in my mind) unless there's more territories added (which I don't think you should do). I'm not too fond of continents with bonuses larger than their territory count. Or, quite large compared to it. Which you have here in a couple places I think.